Welcome to my site! I'm very pleased to be able to share information on my onetime teen idol, Ron Dante, with the masses via this miraculous modern technology called The Internet. Of course, back when I was a child growing up in Paterson, New Jersey during the Sixties and early Seventies, such an undertaking was beyond the realm of my imagination. I was a pretty typical kid, although much more shy than any of my peers. As with most children of that era, I lived in a somewhat limited universe. I walked to school, returning home for lunch; I rode my bike after school, or visited with one of my friends; and I was essentially addicted to rock and roll music and cartoons, in that order. My transistor radio, tinnily blaring the sounds of 77 WABC (the premiere pop station in the New York Metro area), was never far from my ear, and I just HAD to have my nightly dose of The Flintstones at 6:00pm or I went through withdrawal. One day during 1967 or 1968, I can't remember which year, I impulsively picked up a brightly-colored comic book I spotted in the rack at the local drug store. I don't recall which title it was, but it had to have been brightly colored in order to catch my child's eye. That day I read my first Archie series comic, and from then on my love affair with Archie and his Pals and Gals began. I loved to draw cartoons as a youngster, and I now added Archie, Betty and Veronica to my repertoire along with the Flintstones and the Peanuts gang. Very soon I had created my own set of characters who looked suspiciously like the Archie group. I would draw entire comic-book stories complete with dialogue on looseleaf paper and bind the pages together by looping twine through the holes. I thought I was so terribly clever! I was thrilled when The Archie Show premiered on Saturday morning CBS-TV in September of 1968. Just two months shy of my 10th birthday, I was knocked out by the format of the show. My favorite cartoon characters had been transformed into a singing group! From the first time my ears ever heard the twang of the guitar and the tenor voice of "Archie" singing out, "Everythings Archie!," I was completely hooked. Each show spotlighted an original dance along with a brand-new song to dance it to. It wasn't long before I had in hand a copy of The Archies' first "soundtrack" album, their self-titled debut LP which I still possess to this day. 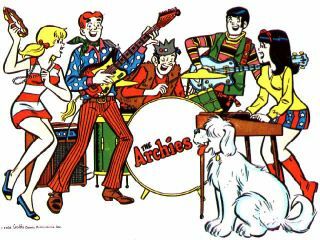 The Archie Show would become The Archie Comedy Hour the following year and would continue to evolve every season for several years afterward, but The Archies as a group kept releasing new material, most notably their smash-hit single "Sugar, Sugar," which to my delight hit Number One on the WABC charts in September of 1969. By this time I had started growing up and going through the normal changes of an adolescent girl. As "Sugar, Sugar" was ascending the pop charts, I was getting my first bra! (Not even a training bra--I bypassed that and went right to the real thing!) I was still painfully shy and had not yet progressed to becoming interested in boys. But all that was soon to change. I can't explain why I picked up a copy of 16 Magazine early in 1970 any more than I can explain why I grabbed hold of that first Archie comic--bright colors on the cover? Fate? Destiny? At eleven, I was still a bit young for that kind of teenagery reading material, but I had always prided myself on the delusion that I was so much more mature than my friends. The April, 1970 issue of 16 Mag may or may not have been the first one I ever bought, but in it was an article that was going to change life as I knew it. 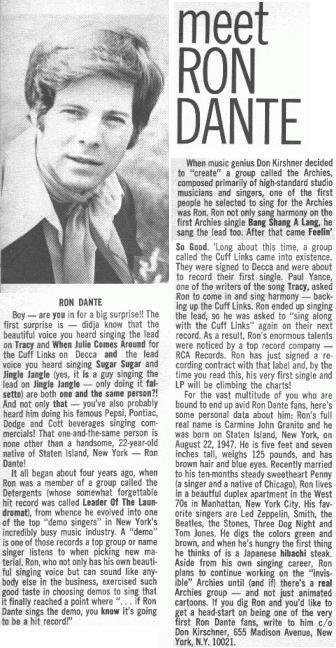 Entitled "Meet Ron Dante," the article revealed for the first time the face behind the anonymous singing voice of my all-time favorite group. I was swept away! It had never before occurred to me to question who was responsible for The Archies' sweet sounds and exquisite harmonies. Now I had a name and a face, and a pretty damn good-looking face besides! That day, I became a huge, huge Ron Dante fan. And I never looked back. There was an address at the bottom of the article. I immediately sat down and wrote a letter to Ron, never expecting to hear back from him. But one day I returned from school and there was a large envelope waiting for me. My heart was thumping as I ripped it open, and it went right up into my throat as I slid out a black-and-white 8x10 glossy of Ron with the signature in the lower left corner: "To Laura, Love Ya Lots, Ron Dante." I was thrilled! No, I was beyond thrilled--I was ecstatic! No, I was even more than that--there are no words that can adequately describe how I felt. At that time, 16 and the other teen mags were full of articles on the heartthrobs of the day--Bobby Sherman, David Cassidy, the Jackson Five, the Osmond Brothers, and so on. But for me, it was, and would continue to be, Ron Dante. 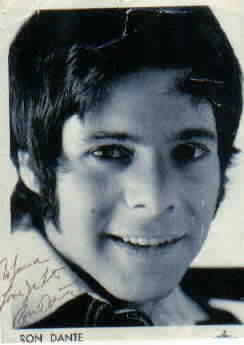 When Ron released his first solo album, "Ron Dante Brings You Up," I was first in line to obtain a copy. I played it so much that I'm surprised I didn't wear the grooves off the record like tread from a tire. In 1971, Ron appeared on a syndicated talk show out of Houston, Texas, the Larry Kane Show. I was perched right in front of my black-and-white TV set to watch it ... so close, in fact, that I probably could have counted Ron's freckles had I so desired. Instead, I taped the entire broadcast by holding the microphone of my little cassette recorder up to the TV speaker. Sad to say, that tape did not survive the decades. I wish we had had VCRs in those days. I was continuing to grow up, and Ron's career was continuing to flourish. He provided the lead vocals for another animated group, The Chan Clan, before going on to other projects such as Spiderman (he was the lead singing voice on the Webspinners LP) and then production for other singers such as a gent named Barry Manilow (yep, it was Ron who produced Barry's beautiful first smash hit, "Mandy."). I was now a teenager living in south Jersey, going to high school, continuing to listen to WABC and play my Archies and Ron records. As a teenager I went through some pretty rough times. Lots of personal problems were hitting me during those years. My shyness didn't help. I withdrew into myself for the most part. But I wasn't totally unhappy. There was always Ron to cheer me up, even though he didn't know he was doing it at the time. That would change, although it would take 30 years. In 1999, I bought my very first home computer, and taught myself to navigate this strange new domain called the World Wide Web. After I gained some confidence on the new-fangled device, the same forces which had gotten me to purchase my first Archie series comic and my first 16 Magazine made me do a Net search for Ron Dante. I was delighted when the results turned up Ron Dante Online! Through Ron's site, I was able to not only catch up on Ron's career through the years but also learn things about him and The Archies that I had never known before. I immediately sent Ron an email letting him know just how special a presence he had been in my life way back when. How fantastic to be able to personally communicate with Ron and tell him all these things which he had no way of knowing when he was a youngster in New York City working at his craft and I was his biggest fan living, at that time, perhaps 45 minutes from him! Everyone loves validation, and I'm certain Ron was pleased to hear how big a part of my life he'd been. 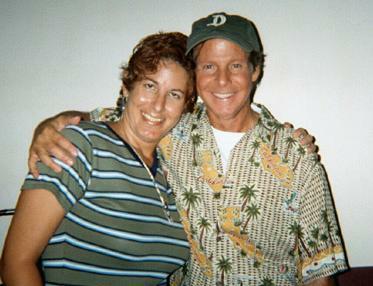 On August 28, 2000, three decades after reading the magazine article that brought on my crush on him, I had the pleasure of meeting Ron personally, after he finished putting on a great concert in Orlando, Florida. Knowing that I would be too nervous to remember my own name (looking back, I'm surprised I made any sense at all when I spoke to him), I had the foresight to write a letter to Ron in which I told him just how much he and his music had always meant to me. He was touched to read the letter, and I was almost bursting out of my skin with a myriad of emotions. It was six days after Ron's birthday, so I handed him a purple gift bag with some belated presents, which included a baseball cap with the word "Florida" on it, a T-shirt, also with the word "Florida" on it (see a trend here? ), and the piece de resistance, a bag of Hershey's Kisses (!) ... 'cause as I told Ron, "When I was 12 years old and had such a crush on you, I always said that if I ever met you, I'd give you lots of kisses. So here you go." That's how an intelligent and articulate 42-year-old woman with a college degree talks when she's meeting her teen idol in person! ENJOY LAURA'S RON DANTE FAN PAGES!! !